Salvinia molesta is an aquatic fern that became a serious weed in Australia, south-east Asia, the Pacific region and Africa. It grows quickly to form thick mats covering lakes, slow-moving rivers and other waterways. These mats severely interfere with the use of water bodies for boating, irrigation, flood mitigation and conservation of wildlife. In some countries village life is disrupted because waterways are no longer navigable. Salvinia has a phenomenal growth rate, doubling its dry weight in two and a half days when conditions are right. In 1978, CSIRO scientists began the search for biological control agents in south-east Brazil which they had identified as the native range of salvinia. They identified a tiny weevil, Cyrtobagous salviniae, as a potential biocontrol agent. After going through the necessary formalities, the first releases were made on Lake Moondarra, an artificial lake providing water and recreation for Mt Isa in north Queensland in 1980. By mid-1981 the weevil had reduced the heavy salvinia infestation to just a few small patches. In all, salvinia has now been controlled by C. salviniae in at least 13 tropical countries. In Sri Lanka alone, this has generated economic benefits of A$16 million, with a return of A$53 for every dollar spent. The CSIRO team that unravelled the complex story of salvinia and Cyrtobagous taxonomy and instigated the biological control project was led by Peter Room and included Wendy Forno, Donald Sands, Martin Taylor and Mic Julien. They received the UNESCO Science Prize in 1985 for work carried out in Papua New Guinea, and the AIDAB (now AusAid) 1988 Award for Excellence in Overseas Development. In 1991 the CSIRO Chairman’s Medal was awarded to Peter Room. Salvinia (Salvinia molesta D. S. Mitchel; Salviniaceae), is a floating aquatic fern. It has a pair of floating leaves at each node and a submerged leaf that is modified to act as a root. Although sporocarps hang among the filamentous roots, salvinia is a sterile pentaploid (chromosome number of 45) and does not produce viable spores. Population increase is by growth and fragmentation. Dispersal is mediated by downstream flow and wind, and by the movement on birds and animals of viable fragments or nodes. It has been spread by man around the world as an ornamental and aquarium plant or as a contaminant of other plant shipments. Salvinia is native to south-eastern Brazil, is widespread throughout the tropical world and was first recorded in Australia in 1952 at Ludenham, NSW and in 1953 at Bulimba Creek, Brisbane. By the 1970s it had become a serious widespread weed in Australia and it now occurs in waterways from the Northern Territory (rivers near Darwin, Kakadu National Park, Nhulunbuy), Queensland (Cairns to Brisbane including Atherton Tablelands and Lake Moondarra near Mt Isa) and New South Wales south to Sydney. It has been recorded from many locations south of Sydney in NSW, Victoria and southern Western Australia, but because of low temperatures it is much less problematic and populations may not persist. Salvinia grows best in still or slow-moving water. It can survive low nutrient levels but rapidly takes up nutrients when they become available, for example during increased flows. It has very rapid growth rates doubling its number and dry weight in less than three days under optimum conditions such as tropical temperatures and unlimited nutrients and forms dense mats that can be several layers of plants deep, blanketing the surface of water. The first surveys for biological control agents for salvinia were conducted in the native range of Salvinia auriculata, including Trinidad, British Guiana and Brazil, from 1961 to 1963. Of 25 phytophagous insect species found on the S. auriculata complex, three species, a curculionid weevil Cyrtobagous singularis (Hustache), a pyralid moth Samea multiplicalis (GuenÃ©e) and a grasshopper Paulinia acuminata (De Geer), were selected for further study. Host-specificity studies were conducted at Belem, Brazil and Curepe, Trinidad during1964’65. C. singularis, a small black weevil 2 mm long, has been collected from species in the S. auriculata complex from northern Argentina, Brazil, Guyana, Paraguay and Trinidad and from Salvinia oblongata Mart. in Brazil. Although it was released in 1971 in Botswana and Zambia and established and spread to the Caprivi Strip of Namibia and to Zimbabwe and was released in Fiji in 1979 and established there it has not contributed to control of S. molesta. The moth S. multiplicalis has been collected from species in the S. auriculata complex in Argentina, Brazil, Florida, Guyana, Panama, Trinidad and Uruguay. It was released in Zambia during 1970 and Botswana in 1972, but did not establish in either. Releases in Fiji in 1976 resulted in establishment but no control of the weed. Though common in the USA, it was not deliberately released there and it provided no control of salvinia. The grasshopper P. acuminata occurs widely in South America and following releases it established in Zimbabwe (1969), Zambia (1970), Botswana (1975), Sri Lanka (1973), India (1974) and Fiji (1975), but failed to establish in Kenya after releases in 1970. It has since spread to Mozambique, downstream from Zambia and Zimbabwe. With the possible exception of the decline of salvinia on Lake Kariba in 1973, P. acuminata was not considered an effective biological control agent. Salvinia declined markedly four years after P. acuminata was released on Lake Kariba. Other factors contributed to that decline and it was not clear how much could be attributed to damage caused by the grasshopper. Before 1978 Salvinia molesta was known only from outside South America. Since it was sterile and had the egg-beater shaped hairs on the upper leaf surfaces characteristic of species in the S. auriculata complex, it was considered a hybrid of species from that complex but without a native range. From January 1978 to March 1982, CSIRO’s Wendy Forno (based in Curitiba, Brazil) conducted a survey for potential biological control agents for salvinia. She found the native range of S. molesta was within the latitudes 24 ° 05′ S and 32 ° 05′ S in south-eastern Brazil. This permitted targeted surveys by Wendy Forno on species in the S. auriculata complex in Argentina, Brazil, Guyana, Trinidad, Uruguay, Venezuela and Paraguay. The natural enemies found by Forno comprised 31 insect and mite species and included the discovery of the salvinia weevil Cyrtobagous salviniae Calder & Sands that has been so important in the control of salvinia worldwide. This weevil (imported as C. singularis), the moth Samea multiplicalis and the grasshopper P. acuminata. were imported into Australia for study in quarantine at CSIRO, Brisbane with the first two subsequently being released in Australia. C. salviniae was found on all species in the S. auriculata complex in South America. The material introduced into Australia was collected from salvinia at a site (26 ° 30′ S, 48 ° 42′ W) near Joinville, Santa Catarina province, Brazil. Host testing by Wendu Forno determined that it was specific to species in the S. auriculata complex. Adults of the small (2 mm) black longsnouted weevil C. salviniae (see RHS panel figure above) are very similar in appearance to adults of C. singularis. When first collected by Wendy Forno from salvinia in south-eastern Brazil it was thought to be a biotype of C. singularis adapted to S. molesta. It was only after releases in Australia that detailed comparative studies determined that it was a new undescribed species, later to be named C. salviniae. The comparisons, conducted by CSIRO’s Don Sands and colleagues, identified differences that suggest why this species, which fed on buds and internal tissues and had higher rates of increase, became an effective agent while C. singularis, which fed externally and not on buds, did not. 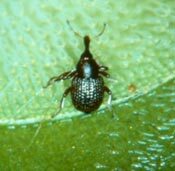 The first releases of the salvinia weevil as a biological control agent were at Lake Moondarra, Mt Isa, Qld in June 1980. Lake Moondarra had a 400 ha mat of salvinia, weighing > 50 000 t fresh weight. The damage caused by the huge population of weevils that developed following release resulted in spectacular destruction of the mat within 15 months, reducing it to less than 1 t (see Figure below). Similar successes were repeated on impoundments, billabongs, rivers, creeks and dams throughout tropical and subtropical Australia. Biological control of salvinia in temperate areas of Australia took longer than in tropical areas, but was successful in coastal catchments in central NSW. The other candidate pest released as a potential control agent was the moth Samea multiplicalus. It lays its eggs singly among leaf hairs and its larvae have five to seven, usually six, instars that feed on leaves under a canopy of silk and leaf hairs. When older larvae tunnel through tertiary form salvinia they cause a ‘shot hole’ effect. When larvae are numerous they destroy most leaves and the salvinia looks very ragged. Its main hosts include S. molesta, Salvinia minima, Azolla caroliniana and Azolla pinnata. The material imported, tested and released in Australia originated from Joinville, Santa Catarina province, Brazil. The first releases were at Mt Isa and Ingham, Queensland in January and February 1981, where it established. Dispersal was rapid and it caused considerable but patchy defoliation of salvinia. Although defoliation could be severe, buds were not damaged and plants continued to grow. S. multiplicalis adults sought undamaged plants for oviposition, so there was no follow-up damage until the plants regenerated. S. multiplicalis has not contributed to the control of salvinia in Australia. The success of the salvinia weevil C. salviniae is a contemporary classic for biological control of weeds because of the extraordinarily rapid (one to five years) and high level (up to 95 % reduction in cover or biomass) control of salvinia. It is a good example of the importance of knowing the native range of the weed. In this case new associations (biological control agents selected from other Salvinia species) were not useful, whereas a useful agent was found once the native range had been defined. It is also an example of the importance of understanding the biology of each biological control agent. The useful agent, assumed to be C. singularis, was found to be a new species and named C. salviniae ; it had very important feeding and behaviour differences that led to its controlling salvinia. Both of these taxonomic issues were solved by sound applied research as part of exploration in the case of the native range of the weed, and as part of post-release studies in relation to insect taxonomy and behaviour. The salvinia weevil system, as a model system to study, contributed to improved understanding of plant ‘ insect ‘ environment interactions. Although the salvinia weevil had been successful in controlling salvinia in cooler climates in Australia in the1980s, the technology was not taken up there at that time. Salvinia infestations in temperate Australia then were small, scattered and largely limited to small impoundments. It was easier to apply herbicides than to manage weevils and wait several years for control. It was not until a significant infestation occurred on the Hawkesbury River, north-west of Sydney, that biological control was successfully implemented, as part of a long-term management strategy to maintain salvinia at low levels after huge amounts of biomass had been mechanically removed from the river. Concurrent studies showed that oviposition by the salvinia weevil can adapt to cooler biological temperatures. The salvinia weevil, C. salviniae, has been released on salvinia in at least 20 other countries with good to excellent control occurring in one to five years in the 17 countries where the outcomes were known. The Australian research that led to these successes was recognised with awards including the 1985 UNESCO Science Prize (team), the AIDAB (now AusAid) 1988 Award for Excellence in Overseas Development (team) and the 1991 CSIRO Chairman’s Medal (team leader Peter Room). Julien M, 2012,‘Salvinia molesta DS Mitchell ‘ salvinia. In: ‘Biological control of Weeds in Australia’, Julien M, McFadyen R, Cullen J, (eds), CSIRO, pp 518-525.